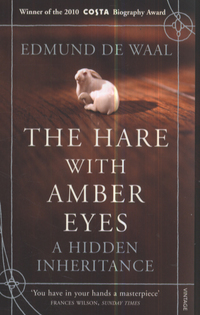 The Hare with amber eyes by Edmund de Waal, who crafts porcelain, has been on the Amazon best seller lists over the last three years and it won the Costa biography award. I haven’t read it, but it does sound intriguing –The book traces the rich and dramatic story of the author’s family’s Russian Jewish heritage and the diaspora in Odessa, Paris, Vienna, and Tokyo He finds 264 wood and ivory carvings of animals, plants and people, none of them larger than a matchbox; as an apprentice potter, Edmund de Waal was entranced by the collection when he first encountered it in the Tokyo apartment of his great uncle Iggie. When he inherited them, he discovered that they unlocked a story larger than he could have imagined. This entry was posted in Book Reviews, Books and tagged Books, de Waal. Bookmark the permalink.